It's Thrifty Thursday with My Creative Time, the day when we try to use up those scraps! I think that Emma's dies are the perfect way to use up scraps, and I always head straight to my scrap drawers when using them. This is an A2 size card, and the second layer is cut at 4" x 5 1/4". I used my Scor-Pal to score it every 1/2 inch. 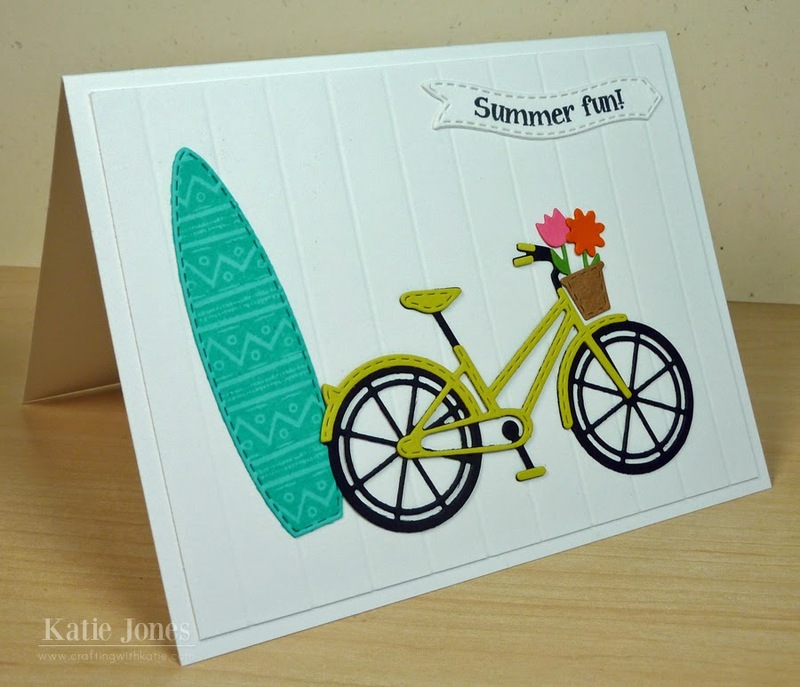 Then I used my favorite bicycle die with the cute flowerpot and flowers from Way to Go to make my sweet bike and the fun surfboard stamp and die from Surf's Up to make my adorable surfboard. The sentiment is also from Surf's Up and is stamped upon a banner made with a die from Fly Away with Me Sentiments. Oh My Gosh Miss Katie what a cute...cute card I just love it!! What fun ways you used Miss Emma's goodies. Love the colors just so bright and playful. YOU ROCK!! Katie, it's amazing how just the simple score lines can add SO MUCH!!! Katie ~ ADORBS!!! Okay using the bike and surf board together ( LOVE it reminds me of the beach) but doing the score lines ~ EEK! So reminds me of a summer house rental! CAUUUTE idea! Summer fun is right. Your bike is so sweet with the flowers and bright bike. The fun pattern on the board is perfect contrast with the solids. The scored background is a super idea...love that! Fabulous job! Love your beautiful card Katie!! The colors are so pretty and those dies look AWESOME!! !